Q 1: A school has a compound wall of 400 feet. A painter was asked to paint the wall. The painter charges $ 80 per sq. ft to paint the wall. The painter has a ladder of length 10 feet. When the ladder rests against the wall its foot is 6 feet away from the compound wall. Find out how much the school pays the painter to paint the compound wall. 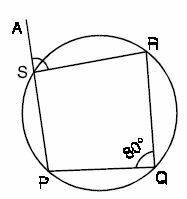 Q 2: Find angle ASR. 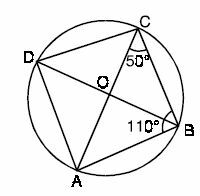 Q 3: Find angle CAB. Q 4: A rectangle is 8 feet long and 6 feet wide. If each dimension is increased by the same number of feet, the area of the new rectangle formed is 32 square feet more than the area of the original rectangle. By how many feet was each dimension increased? 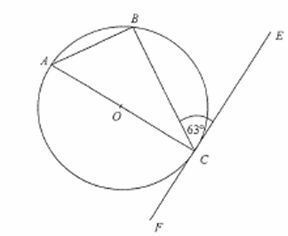 Q 6: Find angle ACB. 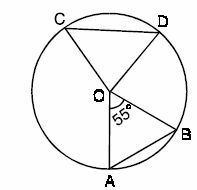 Q 7: AB and CD are two equal chords, if ang AOB = 55o, find ang COD. Q 8: A School had a pole of height 32 feet erected for hoisting flag during annual sport day events. Due to strong gale, top of the pole broke and fell at a distance of 16 feet from its foot. At what height above the ground did the pole break?